See what our customers are saying about Contact Wolf. — M. Stevens, Forum Publishing Co.
— David S., Austin, TX. Totally useful software and a tremendous time saver. based applications, Access (for geeks only or those with masochistic tendencies) and the final and last release of Goldmine (adds a new definition to lousy overpriced support for software that is a pain in the a_ _ to use and configure). I found your application by accident and downloaded the trial version for a quick test drive. 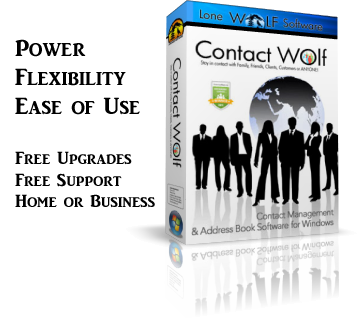 Contact Wolf is a sales contact management application that is: 1) Easy to install; 2) Intuitive to add and edit contacts; 3) Is simple to configure; 3) Has a knuckle dragger so easy to follow GUI interface, you’ve knocked it out of the park. These other applications are top heavy with analysis that would be only used by large organization who have staff who are solely responsible to parse minute information that is totally useless to small and medium size organization. We want to sell, and support our clients, not drown in data that even top management does not understand. Bottom line, this is absolutely the easiest, simplest, fastest contact management application I have seen. Love the ‘word of the day’ (you must have one of my old MD engineers working for you), and the links to maps, which would have been a life save to my prior business.